I will happily argue with anyone that the first LittleBigPlanet was a game more easily appreciated than enjoyed. A marvel of technology and art, maybe not of play. I don't think the sequel will have that problem. I've played Media Molecule's LittleBigPlanet 2 for only about an hour, away from the Sony developers and promoters for this PlayStation 3 game. I tested it in the place where I can best judge games, sitting on the floor in front of my couch. I played it this morning, to be specific, a morning I didn't want to transform into a work day. Watch the video. It features clips of my morning adventures playing through parts of the game's first three worlds. The graphics are great, both impressively realistic and impressively huggable — as they were in LittleBigPlanet 1, that 2008 magnet for so many best-game trophies. Perhaps the game's construction set tools — the parts that will again allow gamers to create and share millions of their own levels, morphing what looks like a descendant of Mario into things that look very very different — will still be the most marvelous thing about this new LittleBigPlanet 2. But I confess that I admired the first LittleBigPlanet more than I hankered to play through it. The game looked great, but, as a side-scroller, it had to compete with my favorite Mario games. It had to vie with my memories of the best Kirby and Castlevanias, the old Metroids and rest of the wonderful two-dimensional games I've enjoyed for years. LBP 1's levels were must-see, but, good as some were, they didn't feel like must-play. 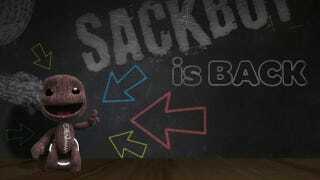 As I played LBP 2 this morning, my feelings were transformed. The game's creators at Media Molecule have added great gadgets — a Bionic Commando-style grappling hook and a cake gun that shoots cakes that stick. There may be more. That's all I've wielded so far. The new items make moving through the game's developer-created levels more fun. Thanks to the developers' smart positioning of grappling points and trampoline-like jump pads, they make moving through the levels more rapid. I didn't hop through LittleBigPlanet 2's levels. I twirled through them. I still don't love the floaty jumping in the LBP games, but the jump pads offer a more spiked leap; the other items make jumping a less common means to get to the end. There are some 40 levels in LittleBigPlanet 2's campaign, with the expectation that gamers will add thousands and thousands more through the game's online-networked creator community. I tried pieces of maybe a quarter of the first 40 and I was having a lot of fun. My old experience was that I played LBP with the desire to quit out of each level and hurriedly see what other levels had been created and uploaded. This morning, I wanted to keep playing what was there. I'll be playing more of this game, of course. I haven't even tried the game's new level creation tools. I will try them soon, hopefully, when I can get back to my couch. Consider me impressed. And consider LBP2 a game that just might have better level design than you'd expect. It'll be out for the PlayStation 3 in January. I'm looking forward to it.